To Cite: Hayati H, Kebriaeezadeh A , Ehsani M , Nikfar S . Cost-Analysis of Treatment of Childhood Acute Lymphoblastic Leukemia Based on UKALL Protocol, Iran J Pediatr. 2018 ; 28(6):e7985. doi: 10.5812/ijp.7985. Background: Health systems have adopted financing to enhance access to care for patients with cancer. The cost of acute lymphoblastic leukemia (ALL) treatment is a blurred image for hospitals and third party payers. The cost of each component of the care should be analyzed to differentiate justifiable cost and to act on wasteful practices. Objectives: Therefore, this is a study on the direct and indirect costs of ALL based on the United Kingdom protocol (UKALL), in pediatric ALL management in Iran. Methods: A retrospective study design was used to study children with ALL managed with UKALL protocol in specialized pediatric hospitals from 2010 - 2015. The data was collected from patients’ medical records. Results: Total direct medical cost per patient was 8282 USD. Most of costs were from inpatient beds (3338 ± 1110 USD) and drug expenditures (2157 ± 1035 USD). The direct non-medical cost incurred by study participants was 1286.4 USD, the total indirect cost of productivity loss was 769.9. Conclusions: The cost of ALL management imposed huge treat on financial capability of peoples caring for children. The treats will affect the whole society and the health system of the country unless strategies are designed to contain the costs. The policy makers from the top level of the country to the service providers should be hand and glove to devise a suitable national ALL management protocol which will avert the observed alarms. Health systems have adopted financing to enhance access to care for patients with cancer. Children with acute lymphoblastic leukemia (ALL) are among those who have benefited from financing (1). Innovations in the treatment of childhood ALL made the care highly demanding. So, the health system should choose management strategies and protocols that can be contained with the existing constrained budget through which the patients receive the utmost benefit (2). Precise cost estimates have untouchable share in policy development. Governmental and non-governmental organizations devise the allotted budget share based on cost of the health service (3). Precise cost estimates should encompass medical and non-medical costs of the illness to provide a clear image of the condition (4). However, the cost of ALL treatment is a blurred image for hospitals and third party payers. The cost of each component of the care should be analyzed to differentiate justifiable cost and to act on wasteful practices. Developing countries can improve health coverage for children with ALL if unjust expenditures are avoided. The obstacles in childhood ALL care are not well noted in Iran (5). In Iran, some incomprehensive works had been done on the medical cost of ALL management, but no study was found on total cost of childhood ALL (6, 7). Therefore, a study on the medical and non-medical cost of ALL will have undeniable contribution on the existing system. The effect will be pronounced if the cost analysis is done on the most commonly used protocol, i.e. United Kingdom protocol (UKALL), in childhood ALL management in Iran. The medical, non-medical and productivity loss of the caregivers are the costs conceived during ALL management. Although efforts have been made to contain the costs of ALL, the total cost of ALL management from the societal perspective is not studied. The aim of this study was to analyze the direct and indirect costs of childhood ALL management based on the UKALL protocol from the societal perspectives in Iran. Patients with relapse or bone marrow transplantation (BMT) before the completion of the first-line therapy were excluded. Patients were followed from the diagnosis until completion of treatment. A total of 895 discharge sheets of patients, who had completed treatment with the UKALL protocol, were covered. It has been more than four decades since United Kingdom Medical Research Council working party devised ALL-UK protocol for the treatment of acute lymphoblastic leukemia. The protocol improved the probability of event free survival (pEFS) of childhood ALL patients. It is among the most commonly used cancer treatment protocols in Iran (8). Cross sectional study design was employed. The total cost of ALL patients treated by UKALL protocol in the past five years was collected retrospectively. Medical costs for both inpatient and outpatient are included. 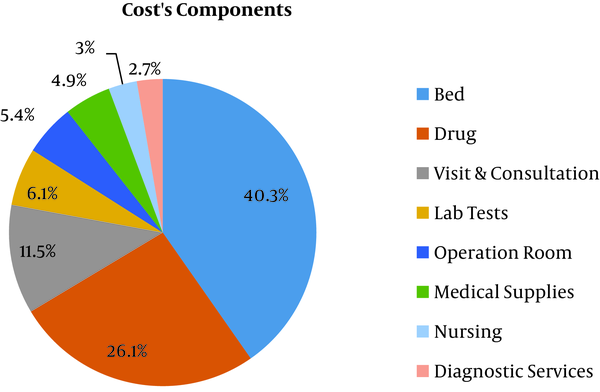 The costs of bed (hospital stay), diagnostic costs, laboratory tests, radiology, visit and consultation, supportive care and chemotherapy, medications for complication management, nursing, operation room, medical aids, services from non-physicians, and finally average direct medical cost for the complete period of treatment per patient are calculated. The cost incurred by caregivers, from seeking care for the child until the care was completed, is collected by self-estimate questionnaire. The costs include transportation costs, accommodation costs, expenses paid for sick leave and cost of care for the dependent families. The average cost per patient = Number of referrals for medical services per year × All expenditures of each visit × Percentage of patients referred from other cities. Productivity loss of childhood ALL is mainly the result of caregivers’ absence from work and decreased performance due to preoccupation by the child’s condition. Therefore, caregivers may have presenteeism which is decreased productivity because of anxiety and preoccupation with the child’s condition leading to less concentration on the job. The second scenario is absenteeism where caregivers might not go to work investing all their time caring for ALL patient (11, 12). The productivity loss was calculated based on friction cost method. The productivity loss of caregivers was assumed to be 80% of ordinary productivity (13). Time lost by unemployed caregivers was assumed as leisure time lost and estimated as 40% of average wage (13, 14). The data was collected by face-to-face or telephone interviews done with the caregivers after their consent was received (11). Value loss due to absence from work (USD) = Number of days absent from work × Average of daily wage (USD). Adjustment of the cost was made based on health care inflation report from the Central Bank of Iran (CBI) from 2010 - 2015 (15). The cost was changed from Iran’s national currency Rial to USD taking the average exchange rate (USD 1.00 = IRR 34000) (15). Statistical analysis was done by Excel and SPSS release 16.0.1. This study was ethically approved by the Research Ethics Boards of Tehran University of Medical Sciences. The mean age of ALL patients participating in study was 3 ± 8.5 years. ALL was more common among boys (61%). The average length of hospital stay was 96 ± 15 days. Majority of the parents (68%) had non academic education and the average monthly income of families was 311 USD. Most of the families (92%) had one kind of health insurance (Table 1). The total direct medical cost per patient was 8282 USD (Table 2). Most of costs were from inpatient beds (3338 ± 1110 USD) and drug expenditures (2157 ± 1035 USD) (Figure 1). Figure 1. Diagram showing direct medical costs, direct non-medical costs, and indirect costs as a percentage of total cost of patients treated by BFM-ALL treatment protocol. The medical cost is higher than any other costs of therapy. The direct non-medical cost incurred by study participants was 1286.4 USD while transportation contributed the largest share (514.5 USD) (Table 3). The total indirect cost due to productivity loss was 769.9. Presenteeism comprised 519.1 USD while the rest 391 USD was contributed by absenteeism (Table 4). Abbreviations: DMC, direct medical costs; DNMC, direct non-medical costs; IC, indirect costs. Finally Figure 2 shows the percentages of types of costs by UKALL treatment protocol. The medical cost is higher than any other costs of therapy (Table 5). Figure 2. The percent of direct medical cost components of patients treated by UKALL protocol. Most of costs were from inpatient beds (3338 ± 1110 USD) and drug expenditures (2157 ± 1035 USD). DMC, direct medical costs; DNMC, direct non-medical costs; IC, indirect costs). This study was the first of its kind done on both direct and indirect costs of childhood ALL management by UKALL protocol in Iran. The current study revealed that a cost of 10338.3 USD was incurred to treat a patient by UKALL protocol. The prolonged hospital stay (96 days) was the most important cause of the highly inflated cost. This cost will definitely pull high economic burden on the country’s health system as well as social security. However, the cost was relatively lower than what was seen in the private health sectors in Iran (1). More than eighty percent of the total cost was contributed by the direct medical costs. The largest share of direct medical cost resulted from cost of hospital bed (40.3%) and drug expenditures (26.1%). This might be due to the prolonged hospital stay and the price of anticancer drugs in the market. This finding was supported by similar studies. Basic hospital costs were huge contributors of total cost in a study from Finland (7). A study by Davari et al. revealed the median direct medical cost of ALL management to be around 4000 USD for the main course of treatment and about 2600 USD for complementary therapies (1). The currently identified total medical cost was equivalent to the outcome of a study done in Bangladesh based on a modified UK Medical Research Council XI protocol (3). But the total mean cost of ALL management in Canada and several European countries was very high (88480 USD) according to Rae et al. (16). Another study from Finland also found higher total mean cost (103250 USD) (7). However, Luo and co-workers in China reported a median cost of 9900 USD (17). Generally, the finding of the current study was equivalent to that in developing countries being far lower than that in developed countries. This difference might be due to the relatively low drug cost resulted from generic drugs use and lower service costs. The calculated direct non-medical cost of ALL management turned to be 1286.6 USD. The large surface area of Iran and the concentration of cancer centers in larger cities might impose on patients high transportation, accommodation and meal costs. This could also be evidenced by the largest share of transportation cost from the total non-medical costs (39.9%). According to a similar study done by Ghatak et al. in India, the calculated nonmedical expenditure was found to be 207 USD (18). This huge difference might be the result of the differences of economic status, the household saving behavior and the accessibility of sites of care. In this study the indirect costs (769.9 USD) had a lowest share of the total costs (7.4%). The presenteeism cost had greatest share of total indirect costs (67.4%). But the study by Ghatak et al. revealed that majority of families (72 %) suffered loss of income and 34% of fathers had lost their job (18). Similarly a pilot study from Canada found that 64% of mothers and 16% of fathers left their job after ALL was diagnosed in their child (19). Another study done in France and England on the impact of childhood cancer on families’ income, generally showed in families who care for a child with cancer, loss of income because of a reduction or termination of parental employment (20). These differences might be from the socio-cultural differences in extended family systems, the employment security systems, the overall political and economic systems of the countries. So, costs of ALL treatment in Iran and other developing countries with those in developed countries shows considerably higher costs in the latter (21). This study is the first study evaluating entirely related costs of treatment of childhood acute lymphoblastic leukemia in Iran. As there was no comprehensive data regarding direct costs in medical records and no depicting to it in interviews with families to extract exact information, this could be reckoned as a limitation to this study. The total cost of childhood ALL management is very high. This imposes huge treat on financial capability of people caring for children. The treats will affect the whole society and the social security system of the country unless strategies are designed to contain the costs. The policy makers from the top level of government to the service providers should be hand and glove to devise a suitable national ALL management protocol which will avert the observed alarms. Finally, since this study was done on patients referred to the main referral hospitals in Tehran, policy makers can use the cost estimates of this study for planning and resource allocation. The authors would like to thank staffs working in the hospitals where the study was performed and also families of children involved in data collection. Authors' Contribution: Study concept and design: Hadi Hayati, Abbas Kebriaeezadeh, Mohammad-Ali Ehsani and Shekoufeh Nikfar; acquisition of data: Mohammad-Ali Ehsani and Hadi Hayati; analysis and interpretation of data: Hadi Hayati, Abbas Kebriaeezadeh, Mohammad-Ali Ehsani and Shekoufeh Nikfar; drafting of the manuscript: Shekoufeh Nikfar and Hadi Hayati; critical revision of the manuscript for important intellectual content: Shekoufeh Nikfar and Hadi Hayati; statistical analysis: Hadi Hayati and Abbas Kebriaeezadeh; administrative, technical, and material support: Abbas Kebriaeezadeh, Mohammad-Ali Ehsani and Shekoufeh Nikfar; study supervision: Abbas Kebriaeezadeh, Mohammad-Ali Ehsani and Shekoufeh Nikfar. Funding/Support: This paper resulted from a Ph.D. thesis of the first author and was supported financially by Faculty of Pharmacy, Tehran University of Medical Sciences. 1. 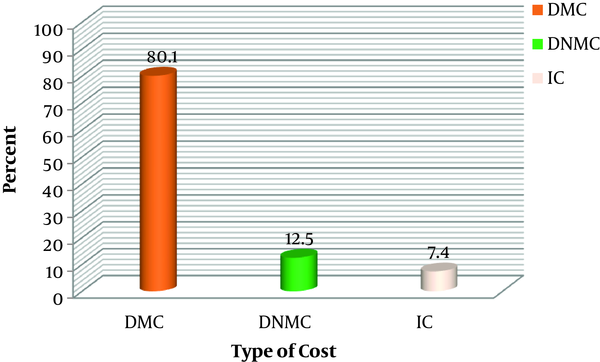 Davari M, Moafi A, Yarmohammadian MH, Khayyam Haghighi E. [The direct medical costs of acute lymphocytic leukemia (ALL) in children in Isfahan province]. Health Inf Manage. 2015;11(7):1046. Persian. 2. van Litsenburg RR, Uyl-de Groot CA, Raat H, Kaspers GJ, Gemke RJ. Cost-effectiveness of treatment of childhood acute lymphoblastic leukemia with chemotherapy only: The influence of new medication and diagnostic technology. Pediatr Blood Cancer. 2011;57(6):1005-10. doi: 10.1002/pbc.23197. [PubMed: 21618420]. 3. Islam A, Akhter A, Eden T. Cost of treatment for children with acute lymphoblastic leukemia in Bangladesh. J Canc Pol. 2015;6:37-43. doi: 10.1016/j.jcpo.2015.10.002. 4. Kalantari H, Davari M, Akbari M, Hejazi SM, Kalantari M, Zakerin S, et al. The estimation of direct medical costs of treating patients with chronic hepatitis B and C in Iran. Int J Prev Med. 2012;3(3):191-6. [PubMed: 22448312]. [PubMed Central: PMC3309633]. 5. Liu Y, Chen J, Tang J, Ni S, Xue H, Pan C. Cost of childhood acute lymphoblastic leukemia care in Shanghai, China. Pediatr Blood Cancer. 2009;53(4):557-62. doi: 10.1002/pbc.22127. [PubMed: 19526524]. 6. Hayati H, Kebriaeezadeh A, Ehsani MA, Nikfar S, Mehrvar A. Cost-analysis of treatment of pediatrics acute lymphoblastic leukemia based on ALL-BFM protocol. Int J Pediatr. 2016;4(9):3381-9. doi: 10.22038/ijp.2016.7370. 7. Rahiala J, Riikonen P, Kekalainen L, Perkkio M. Cost analysis of the treatment of acute childhood lymphocytic leukaemia according to Nordic protocols. Acta Paediatr. 2000;89(4):482-7. [PubMed: 10830464]. 8. Eden OB, Harrison G, Richards S, Lilleyman JS, Bailey CC, Chessells JM, et al. Long-term follow-up of the United Kingdom Medical Research Council protocols for childhood acute lymphoblastic leukaemia, 1980-1997. Medical Research Council Childhood Leukaemia Working Party. Leukemia. 2000;14(12):2307-20. [PubMed: 11187922]. 9. Kavosi Z, Zare F, Jafari A, Fattahi MR. Economic burden of hepatitis B virus infection in different stages of disease; A report from southern Iran. Middle East J Dig Dis. 2014;6(3):156-61. [PubMed: 25093064]. [PubMed Central: PMC4119673]. 10. Ong SC, Lim SG, Li SC. How big is the financial burden of hepatitis B to society? A cost-of-illness study of hepatitis B infection in Singapore. J Viral Hepat. 2009;16(1):53-63. doi: 10.1111/j.1365-2893.2008.01042.x. [PubMed: 19192158]. 11. Liljas B. How to calculate indirect costs in economic evaluations. Pharmacoeconomics. 1998;13(1 Pt 1):1-7. [PubMed: 10175982]. 12. Koopmanschap MA, Rutten FF, van Ineveld BM, van Roijen L. The friction cost method for measuring indirect costs of disease. J Health Econ. 1995;14(2):171-89. [PubMed: 10154656]. 13. Ganjali M, Baghfalaki T. Bayesian analysis of unemployment duration data in presence of right and interval censoring. J Reliab Stat Stud. 2012;5(1):17-32. 14. Statistical Center of Iran. [cited 2016 July]. Available from: http://www.amar.org.ir. 15. Central Bank of Iran. [cited 2016 July]. Available from: www.cbi.ir/exrates/rates_fa.aspx. 16. Rae C, Furlong W, Jankovic M, Moghrabi A, Naqvi A, Sala A, et al. Economic evaluation of treatment for acute lymphoblastic leukaemia in childhood. Eur J Cancer Care (Engl). 2014;23(6):779-85. doi: 10.1111/ecc.12173. [PubMed: 24393150]. 17. Luo XQ, Ke ZY, Guan XQ, Zhang YC, Huang LB, Zhu J. The comparison of outcome and cost of three protocols for childhood non-high risk acute lymphoblastic leukemia in China. Pediatr Blood Cancer. 2008;51(2):204-9. doi: 10.1002/pbc.21598. [PubMed: 18454471]. 18. Ghatak N, Trehan A, Bansal D. Financial burden of therapy in families with a child with acute lymphoblastic leukemia: Report from north India. Support Care Cancer. 2016;24(1):103-8. doi: 10.1007/s00520-015-2757-y. [PubMed: 25940031]. 19. Limburg H, Shaw AK, McBride ML. Impact of childhood cancer on parental employment and sources of income: A Canadian pilot study. Pediatr Blood Cancer. 2008;51(1):93-8. doi: 10.1002/pbc.21448. [PubMed: 18085689]. 20. Miedema B, Easley J, Fortin P, Hamilton R, Mathews M. The economic impact on families when a child is diagnosed with cancer. Curr Oncol. 2008;15(4):173-8. [PubMed: 18769610]. [PubMed Central: PMC2528308]. 21. Hayati H, Kebriaeezadeh A, Ehsani MA, Nikfar S, Sari AA, Troski M, et al. Treatment costs for pediatrics acute lymphoblastic leukemia; comparing clinical expenditures in developed and developing countries: A review article. Int J Pediatr. 2016;4(12):4033-41. doi: 10.22038/ijp.2016.7791.